In China, so much that is local is seasonal. Microeconomics and parochial concerns drive much of family decision-making in the country’s provinces and neighborhoods. That includes pricing, to be sure; but often it’s simply the availability of produce. So while policy elites in Beijing might debate the restructuring strategy of state-owned enterprises, the local tactics of residents are far more immediate, reactive more to the lunar calendar than they are to central directives. A couple of cases illustrate how Nanjing and the counties that comprise it are in the midst of the transition into the fall season. One is the disappearance of certain foodstuffs. Of course, residents in Nanjing itself—that is, the metropolis—can choose from just about anything in the growing number of larger grocery stores here; it’s in the countryside where certain vegetables and fruits disappear until next year, a new season. Plus, many locals prefer their nearby market, because freshness is crucial. 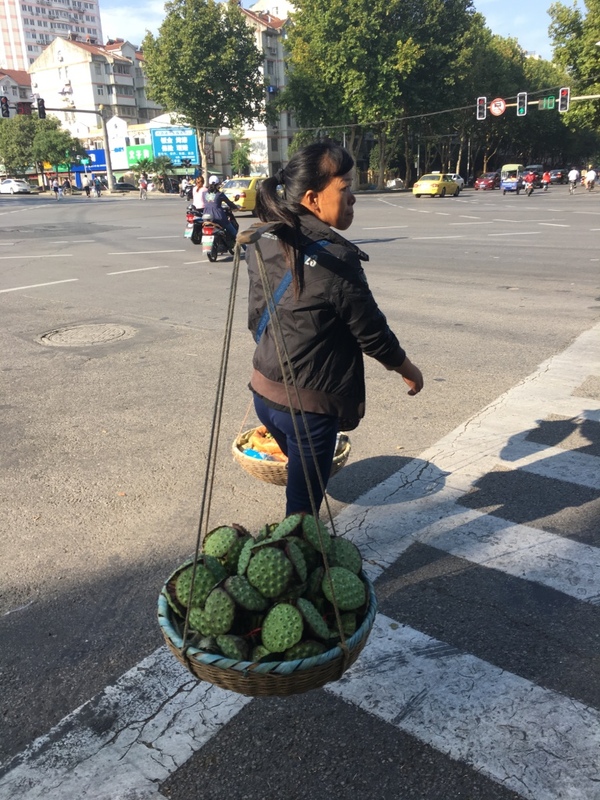 The further one is from Nanjing, the more challenging the task, as local markets there depend directly on nearby farmers bringing their produce for sale because wholesalers focus on the city. This cycle is nothing new, and residents prepare different recipes as a matter of routine. With prices relatively stable (save pork, which has been affected by recent flooding in various localities), the real issue is local supply. When there are shortfalls—particularly of fruit—farmers in regions outside of Jiangsu often show up in Nanjing with specific local produce for sale. 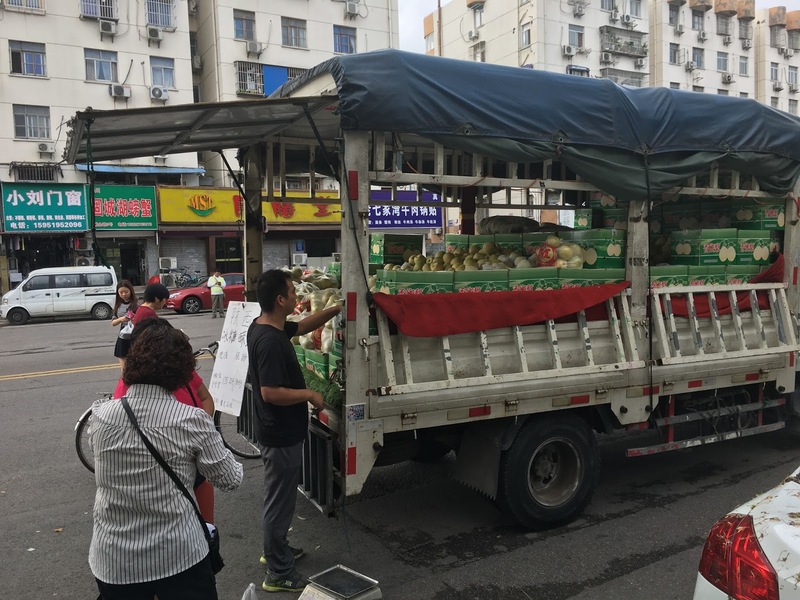 It’s common at this time of year to see large trucks selling apples, pears, and other fruit that hails from different provinces, thanks to the extensive road network that connects much of China’s east to elsewhere. These lorries show up suddenly, and disappear almost as quickly after a few days, when their stock is exhausted. Some vendors are middlemen, simply transporting supplies for others, though most are in the business of growing and selling themselves, especially those offering produce from the next province over. 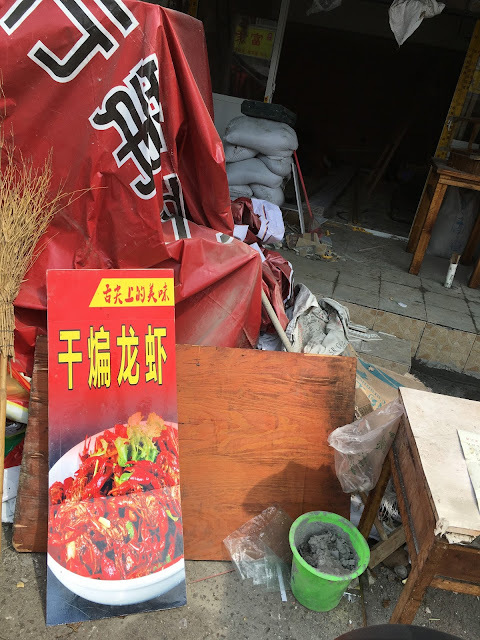 Interestingly enough, urban management officers [城管] in Nanjing largely leave these visitors and their products alone, sometimes sampling the fare, but rarely hassling the salespeople; they recognize that attempts to harass sellers risks the wrath of local buyers. And for their part, those hawking foodstuffs often find out when and where the officers will be by using WeChat, so as to avoid confrontations. It pretty much works out for all concerned, in large part because Nanjing isn’t Beijing, where police punishing people trying to make an honest living seems to be local sport, or at least sanctioned public policy. Another seasonal shift visible here is certain local restaurants closing for renovation. Some are in Nanjing’s outskirts, which are more dependent on tourists, workers provided holiday time and transport by their employer, and retirees (especially from Shanghai and its suburbs). As the summer trade ends, and both parents and grandparents become tied down to the care and feeding of children and grandchildren, there are fewer reasons and opportunities to travel—and thus, less motivation to keep eating places open (owners have families as well, and the staff tends to be mostly family anyway). These restaurants will often simply cease operations, and wait to see what next year’s season brings. What might seem to the unpracticed outsider to be a decline in commercial circumstances (and a further sign of a struggling national economy) is simply the rhythm of local economic life. 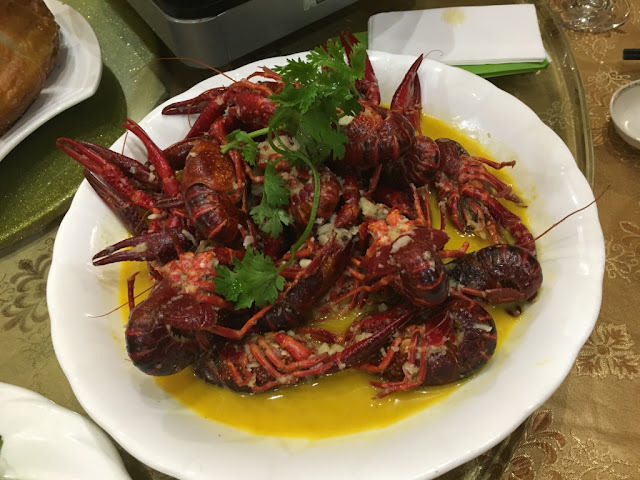 In Nanjing itself, there’s a specific sort of restaurant—that catering to the consumption of local crayfish [龙虾]—that does brisk business during the summer. There are a few places that still offer it on their menu, but everyone in Nanjing knows that the fresh variety expired a few weeks ago. There have often been health concerns about these “small lobsters”, and places trying to sell them in September are avoided at all costs (except by unsuspecting tourists). Many local restaurant owners in Nanjing, having used their space to take advantage of the high summer season, are now in the midst of changing their fare, their décor, and the name of their establishments, offering more standard family fare [家常菜] for the most part—though some will look to sell something more specific from their small spaces. That's unlike other places of power in China. Beijing is where good restaurants go to die, as ruthless landlords regularly expel outsiders who cannot afford a jump in rent (especially in the middle of a lease) and new establishments set up shop, only to be booted out themselves in a few months, so that very few have a chance to gain a foothold and offer good fare for a fair price. In Nanjing, shop owners and landlords are usually residents themselves, and often the very same people. That sort of continuity helps sustain local society. This reliability isn't resistance to authority per se, though it's partly political, to be sure: After all, good local governance leaves good things alone. It's really the product of amendments and adjustments by residents who simply recognise the seasons. It may not be transformational, but the tradition of transition matters in the life of local China.